Prague Castle is the most important Czech castle standing above the Vltava river in the center of Prague. From the 9th century it had been the seat of Czech princes and later kings and since 1918 is the residence of the president. The castle with dimensions about 570 m length and 128 m width, is one of the largest castles in the world. It is regarded not only as a symbol of the city, but also the Czech statehood and according to the Guinness Book of Records for the largest ancient castle in the world. Inside the castle there is St. Vitus Cathedral, the traditional place of coronation of Czech kings and their final resting place. 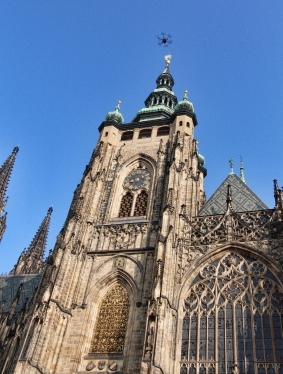 In March 2015 came the first and only Czech company UPVISION, permission from the Prague Castle Administration, Office of the President and especially the Civil Aviation Authority, permission to fly UAVs in the no-fly zone Prague Castle. This zone is strictly guarded and monitored and every attempt at flying here with UAV, may end a fine of up to almost 200 000 EUR. At the same time, it is highest guarded no-fly zone in the country. The purpose of flying UAV, was to get air video documentation Prague Castle complex, including the Royal Gardens. In addition, were taken panoramic photos at different heights from which will be create air interactive spherical views, used for aerial virtual tour. The main output was, orthophotomap in Czech coordinate system with high image resolution 2,5 cm/pixel. This high-resolution orthophoto is important complement technical map Castle for technical purposes Prague Castle. “The whole mapping took place under strict security and it was attended by soldiers of the Castle Guard, who provided safe running. Mapping lasted for several hours from early morning, with exchanges camera mounts and camera lens, always for the purpose of photographing with the best possible results. From several hours mapping, we have almost 100 GB unique data “, adds co-owner UPVISION Jakub Karas. Outputs will own the Prague Castle Administration, which video and virtual tour of the complex in the future will share on their website. This entry was posted on Tuesday, May 19th, 2015 at 10:51 am. You can follow any responses to this entry through the RSS 2.0 feed. You can leave a response, or trackback from your own site.